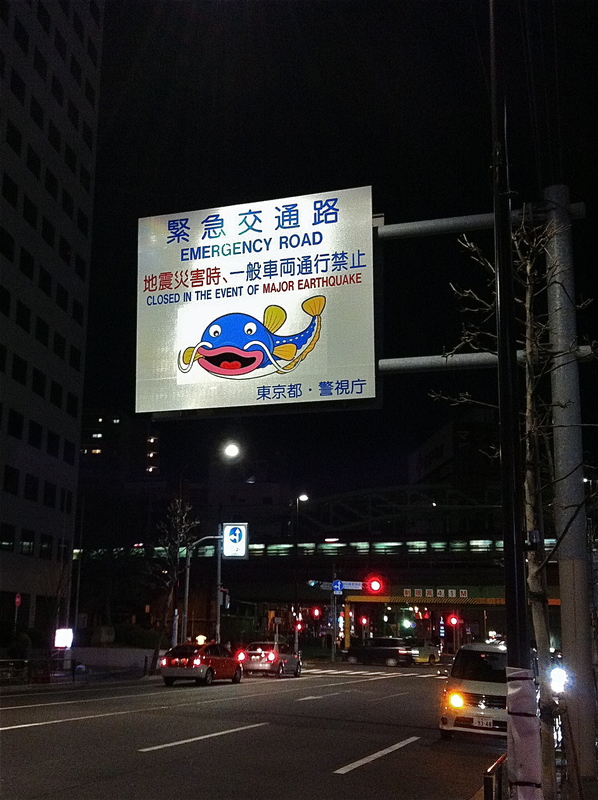 Um, and just what kind of emergencies ARE they saving this road for? A plague of toads? A horde of locusts? Virulent sunspots? Attack from the planet Krypton? An infestation of soccer hooligans? Zombie armageddon? One of those freaking huge rivers of Chinese ducks? Kanji slackers such as myself see a sign like this and think this so-called emergency road is mysteriously exempt from serving during the one emergency that’s most likely to occur in Japan. But in fact, what the sign says is that in case of emergency like a major earthquake, the road is closed to regular vehicles and only emergency vehicles are allowed to use it. Oh, and about that Emergency Road Mascot: Apparently, in these here parts, riding out an earthquake is supposed to feel like sitting on a squirming catfish. Do I feel reassured by its cheerful cross-eyed presence? Hmm. I think not. Thanks for cluing me in on the catfish theory! I belatedly went off and did a search on this after you prompted me to get my story straight, and indeed, for centuries, a giant fish named Namazu has been getting blamed every time the earth shakes in these here parts. They even cancelled an episode of Pokemon featuring a scary catfish-like creature when it was scheduled to air too soon after a major quake!